You can save hundreds of dollars, flying from Miami to Ecuador, if you create an itinerary with two plane changes in Colombia. Arlo’s Travel Tip #17: Don’t do that. My mom dropped us off at the airport in Norfolk, Virginia on Wednesday afternoon (she drove off in our Jeep, promising to take care of it while she stays in North Carolina.) Our flight down to Miami was on a commuter jet, but it was so short, I didn’t mind at all. We stayed overnight at the Miami Courtyard Marriott, which had the most magnificently comfortable bed! Unfortunately, we stayed up half the night repacking our backpacks (and taking pictures for insurance purposes.) Oksana was freaking out. We only got 3 hours of sleep and were back at Miami International by 5:30am. It didn’t take long before something went wrong. The counter jockey at LAN airlines wouldn’t check our bags all the way through to Quito. I’ve never had a problem like that with international flights, but he insistently mumbled something about Colombian regulations. I asked if we were going to have to clear customs and immigration just to recheck our bags. Again, he mumbled, “Colombian regulations”. First flight was great! Breakfast provided and seat-back movies on demand (Oksana watched Killers, I played just enough of The Other Guys to see the Tuna-Lion exchange again before enjoying the Cloony/J. Lo masterpiece, Out of Sight.) When the flight attendant came along, handing out Colombian immigration forms, he almost passed us by. I asked if we might need them to retrieve our bags. “Why didn’t you check your bags all the way to Quito?” he asked. Oksana continued to freak out. Because it’s so difficult for an American company to do business with Cuba, it can be quite an ordeal to find a flight from the U.S. If you’ve got all your Treasury ducks in a row, though, it is possible. Believe it or not, there are plenty of run-of-the-mill, passenger flights out of Miami. From what I’ve been able to gather, most of them are filled with Cuban-Americans visiting their families. They can only get a visa for 21 days total in a year, though, and flights around Christmas are usually full. If you’re thinking about going to Cuba when it’s all chilly and cold up north – what better time? – then you better plan ahead and buy your tickets in September. 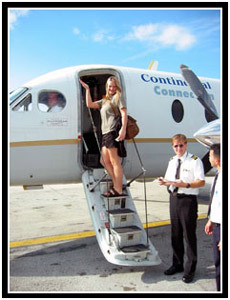 Gulfstream Air, Tico Travel, and Marazul Charters are some likely candidates to get you started. We used Tico Travel on our first trip and while they got us there and back, we had some hitches that made the trip more worrisome that it needed to be (although they made right with everything in the end.) Gulfstream is a company owned by Continental Airlines and we used them on our second trip. If things go well, expect to pay roughly $350 round trip from Miami to Havana. If plans blow up in you face, you can still get there for $9014!